The first citrus trees were brought to Hawaii in the early 1800’s. These first trees grew and produced so well in Hawaii that many more varieties were imported and hybridized in the following centuries. Today Hawaiian gardeners enjoy growing many different types of citrus in backyard gardens and small orchards. Even dwarf cultivars can produce tremendous harvests for little effort in just a few years. Proper regular pruning is one of the most essential factors contributing to vigorous citrus trees and abundant yields in Hawaiian gardens and orchards. Remove any crossing branches with clean, well-sharpened loppers or pruning shears each year, just after the main harvest has finished. Make the cuts at a 45-degree angle so that the wound will be protected from rain. Wear gloves and long sleeves to protect your hands and arms from the thorny branches of lime and lemon trees. Thin any interior branches to promote good airflow and open up the canopy to more light. This increases yields and is essential to tree health in Hawaii. Start at the branch tips and follow down the limb until you see healthy wood. Locate the nearest vigorous shoots facing away from the center of the tree and make your cut there. Remove any suckers and shoots growing out of the rootstock which deplete energy from the tree and may fail to produce the desired type of fruit on grafted trees. Shear branch tips lightly with pruning shears to maintain a balanced shape and manageable size. Prune new wood sparingly because the majority of citrus fruit is set on wood that is less than 2 years old. Prune away any dead branches with loppers or pruning shears whenever you prune the live wood, or any other time it’s convenient, since this will not affect fruiting. Dispose of dead wood away from live citrus trees to reduce the possibility of spreading insect pests, fungi or other pathogens. Begin pruning when trees are young to establish a good, basic shape. This is important to remember in Hawaii because citrus can grow rapidly in one or two seasons. Avoid pruning just before flowering because this will reduce fruit production. Never remove more than 1/3 of the major branches of any citrus tree to avoid depleting natural carbohydrates and nitrogen from the tree. Prune lightly and regularly for optimal tree health and productive harvests. 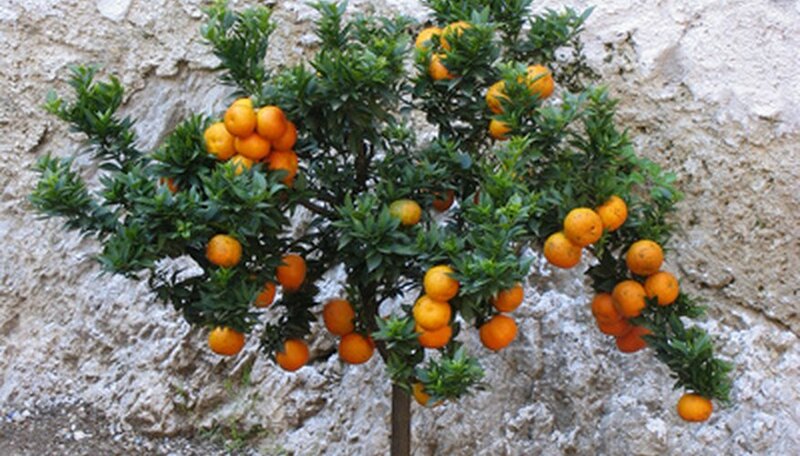 Do not fertilize your citrus trees before pruning live wood to avoid triggering a flush of new vegetative growth.